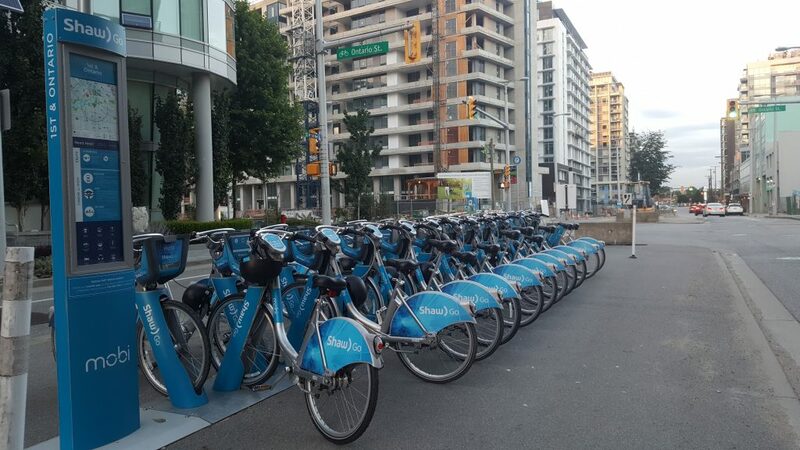 As I withdrew this year (after several years of inactivity) from a car-share program, I started to seriously consider bike sharing the more I see bike stations popping up around the city. I considered it even more seriously upon the June 5 announcement of an increase in Translink fares effective July 1. Is it crazy to do a bike share when I have my own perfectly decent bicycle? My daily commute to work is a 30-minute walk, 35-minute bike ride (including the time it takes to fetch my bike from a locker in my parkade and then lock it up at work in a locker in the parkade), or 20-minute subway ride (door-to-door). No wonder I end up on the subway four days a week out of the four days a week I work. It’s only two stations and after the 10-minute walk and on days when we jam up like sardines, I feel like it’s not worth the $2.10 one-way fare (increased to $2.20 after July 1). A bike rental will work for me because of the nature of the service that allows me to pick up the bike at one station (downtown, just outside my office building) and drop off at another (one block away from the condo). While I don’t foresee ever getting out of the house early enough in the mornings to bike to work – besides, it’s uphill – I always have more time after work, especially to grab a bike and coast downhill home. When I don’t have to go through visiting bike lockers, the ride itself only takes about 15 minutes. Riding only one way doesn’t work when I’m using my own bike! If I can’t find that Groupon/Living Social/Social Shopper for a discount on a year’s membership, I will pay the full price of $129 for unlimited 30-minute rides. That time limit is all I need and at the new Translink 1-zone one-way fare of $2.20, it will take 62 rides for me to break even or approximately four months of riding every day in the afternoon. Which is just the kind of incentive I need to track my usage and break even as quickly as possible and thereafter start calculate my savings, too! Besides having to then carry my own helmet – although one is provided if needed – every day and it’s not a huge concern as I routinely bring a large bag to work anyhow, I worried that I wouldn’t be able to ride the heavier, fixed gear bike. There is always a flock of pigeons at the station closest to my work, at Georgia and Granville. They are doing their business on any and all of the bike seats/handlebars/helmets. How toxic are the surfaces?? The seat adjustment was really sticky and it didn’t seem to go all the way to the lowest, which was listed as for 155 cm tall people and I’m only about 152 cm. Which meant that on the bike I tried out, and wearing flat shoes that day, I couldn’t touch the ground and so I didn’t feel secure. A few days later, at a station closer to home and not in the heat of mid-day with the bustle of crowds, I tried a bike. The seat adjusted easily and in the lowest position and when I’m wearing runners, I can stand on tip toes on one foot with the other on the pedal. The bike is not leaning against me so much and I can learn to deal with the weight of the bike. I biked 1.9 km in a loop around my house and then returned the bike, ready to try it “live”. Day 1: All of the bikes at the Georgia and Granville station were spoken for shortly after 5 p.m. except for one. Two guys were milling over their bikes and the unclaimed one, its seat was covered in bird sh*t. I’m not going to put it lightly. Like crusted on. I did not need to use that particular bike and walked three blocks to the station at Richards and Dunsmuir where there were plenty of bikes. The only problem was that Mobi’s network had gone down. It had been down for a couple of hours by 5 p.m. and would stay down for another 14 hours or so. Very bad press. Since one user managed to get a bike but then couldn’t adjust the seat, she had to relinquish the bike but couldn’t get another one. I tried about six bikes but didn’t luck out as she had. I stomped home feeling highly overdressed for the weather for walking. Day 2: All of the bikes at Georgia and Granville station were out except for one. Why? Because its seat is covered with crusted bird sh*t. Although I threw a pack of body wipes into my bag, I wasn’t going to be scrubbing a bike seat and proceed to sit on it, not unless it was a Lysol wipe or two. So I walked to Richards and Dunsmuir – just a three-block walk but it’s not going to be pleasant if it’s raining and it’s not what I signed up for – where there were four bikes left and while I was unlocking my bike, all of them came into use. The reverse problem of availability nearly occurred at the station where I wanted to drop off my bike (Ontario and 1st) where the station was nearly full and I snagged the last spot. Another station is equidistant from my apartment but a farther ride. Whew! Anyhow, I’m committed to my membership. I have submitted my feedback to Mobi to push for improvements and will adjust to my new routine. In fact – here’s hoping – when I’m comfortable with the bikes after a few more rides, I can ride to work because the bike availability should make for really smooth sailing.